The first edition of the Art+Tech Exhibition showcased individual 8 artworks, loosely based around the theme of ‘Identity and Urbanization.’ Except for one, all works were interactive and created in collaboration by technologists and artists over 40 days in October and November. Each exhibit was supplemented with an artist statement, which included the biographies of all collaborators involved. The week long exhibition attracted more than 10,000 visitors, bringing together artists, art lovers, tech enthusiasts, engineers and, most importantly, laymen who would not have otherwise come to an art exhibition. The most significant constituent of the viewers were young Nepalis between the ages of 12-25. The exhibition was also the venue for the Yantra Speaker Series, where artists and technologists presented on specific topics relating science to the arts (details in the Speaker Series section). Part of the exhibition space was also used to host the Children’s Workshop (detailed below). The exhibition was officially inaugurated on 8 November through a soft opening to host select invited guests who were invited through emails and social media sites. A formal closing event was held on the last day of the exhibition. The closing included speeches from international guests and a art-tech/fashion happening event. The 8 artworks were exhibited at the Nepal Art Council in Babermahal, Kathmandu. The First Floor Gallery was used for the event. In the floor plan above, structures, projections and the flow have been designated. As shown, part of the venue was used for the Children’s Workshop (CW). The staple piece for the exhibition was “Mane.” Based on the design and function of a traditional prayer-wheel, the installation presented stories on how children learn , inside and outside of the classroom. Besides, the pictorial etchings installed on the surface of the wheel (9 feet in height, 5 feet in diameter), turning the mane (in either direction), triggered two separate animations: one depicting the imagery of the etching (P1) and another (P2) with controlled Dhaka (traditional Nepali fabric) patterns filling out the empty black frame of the projection. “Strange Fascination” was installed inside a rectangular room. The installation focused on the malleability of personal identity and presented viewers with a video loop that incorporated candidly recorded footage of the viewer’s face. Building on the research carried out by American artist Joy Lynn Davis, “Revisiting Kathmandu Valley’s Lost Sculpture,” was presented as a structural installation mimicking a traditional facade with empty niches. Reaching inside the niche produced animations of satellite images, photography and images of paintings made by Davis to educate on the statues that have been stolen. The viewers were given information on the size, year of production, year stolen and current location of 13 specific sculptures. The only non-interactive piece at the exhibition was the display of a small Francis Turbine created using traditional foundry technologies of Nepal by Kathmandu University’s Turbine Testing Lab. Physical displays were supported by extensive texts on the process of Lost Wax casting used to fabricate the turbine. Other topics covered in the text were the challenges facing hydropower turbines in Nepal with an overall aim to highlight the role traditional knowledge could play in modern engineering practices. “Scan Me” was a QR code installation supported by a local server that required the use of a smartphone or tablet to trigger specific video/audio or photographic content embedded in the code. All media related to Nepali culture and issues of urbanization. ArtLab’s “Prasad” was a video installation projected over a typography structure. As the “Prasad” project deals with presenting national and local heroes of Nepal through the medium of street art, the projection were made up of short clips featuring busy streets and alleyways. Viewers could project their own drawings onto the project by physically drawing over a piece of glass installed in front of the project. “Jigsaw” was an installation of two jigsaw puzzles that triggered images when all the pieces were correctly placed to form a complete image. The pieces of the puzzles depicted objects related to notions of beauty and the dowry system, both alluding to problems faced regularly by women in South Asian countries like Nepal. “Interactive Galaincha” was created in-house at Alternative Technology, the world’s foremost producer of carpet-production software. The installation used information (colors and hand gestures) inputed by viewers to change the patterns of an ‘electronic’ carpet projected on the wall. As is with any novel approach the biggest strength was the innovative naive nature of the event. The exhibits ability to interact directly with the audience was also a significant strength. This interaction did away with misconceptions held by many lay viewers that art is exclusive and inaccessible. By presenting action based on viewer input the exhibits accentuated intuition over reflection. Additionally we observed that exhibits that incorporated traditional designs and subject matters were especially appealing to lay viewers. Guided tours were another helpful and effective medium of controlling viewer perception and their engagement with each piece. 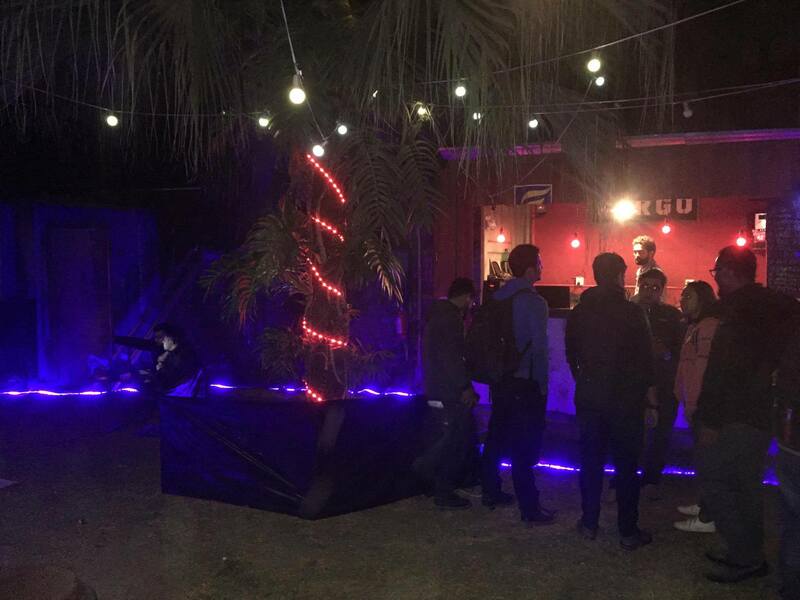 On the other hand, one of the biggest challenges of the executing the show was the logistical requirements. Majority of the works required projectors (for two of the works, two projectors were used), and the use of a portable computer. Out of the 8 projectors used in the exhibition, 6 were rented from the Siddhartha Art Gallery and 2 were supplied by the artists themselves. Likewise two computers were supplied by the Siddhartha Arts Foundation, and the other 6 were provided by individual collaborators. Even though, statements and profiles were printed and put up next to each artwork they were not observed by the viewers. As evident through “Revisiting Kathmandu Valley’s Stolen Sculptures,” exhibits that used projection should have had their statement projected on to the wall instead. Issues arising from lack of adequate (and adequately trained) manpower were also evident. On the tech side, troubleshooting the interactive elements especially for the works with triggered responses was a frequent issue. So much so that some works were only operational for a fraction of entire exhibition run. As a result of Yantra 3.0 more engineers are familiar with the requirements of Art+Tech collaborations and thus we have to have better manpower available for Yantra 4.0. For the next art-tech exhibition, the dependency on digital aides (such as projectors, laptops, smartphones) should be curbed or in-kind sponsors of such infrastructure/equipment should be sourced. An alternative would be to create works like “Scan Me” where the requirements of interaction is limited. Alongside digital pieces, manually interactive pieces should also be encouraged. The curation showed room for improvement. Gallery management including installation and setup tasks need a more focused engagement from the organizers. The lack of adequate preparation for the event co-ordinators meant the experience the tours provided were uneven, varying by the familiarity of the guide with the event. This issues will be addressed in Yantra 4.0 by engaging senior artists and curators in the planning stages of the event. Furthermore it will be necessary to engage other partners that can contribute manpower familiar with art and exhibits. In hindsight, providing artists financial support necessitated better orientation on proper use of the funds. There were instances where funds were used for personal necessities which could create auditing issues for the organizers. Press promotion of the art-tech exhibition cut into the coverage received by the other events held during the Festival. It is recommended that the events are structured in a way, such that all events are equally highlighted. Or as mentioned, changing the duration of the exhibition would help distribute coverage better. Last year, Yantra 3.0 initiated a conversation between artists and engineers through the creation of 7 collaborative artworks. While the edition was well-received it was not short of challenges unique to the particular content on display. Logistics and troubleshooting were a constant source of anxiety. 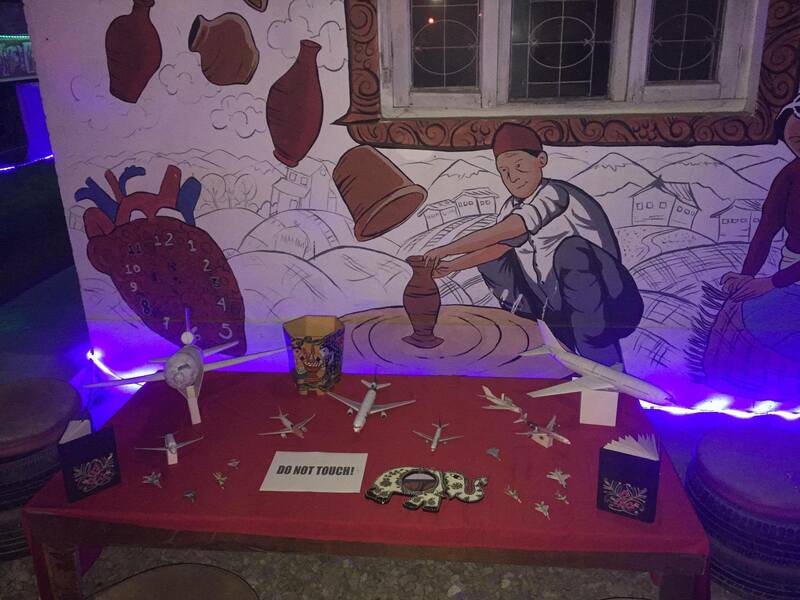 Then again, the novelty of interactive art and the unlimited possibilities embedded in the unprecedented (at least in the context Nepali contemporary arts) collaboration were encompassing as well as encouraging for the organizers. For Yantra 4.0 a few changes were made. The interactive art section for this edition features only 4 works. This intentional downscaling was carried out to emphasize the creation of fewer, but more immersive exhibits. Our approach to the production of the artworks was also revised. Instead of identifying and bringing together those (artists/techies) interested in working together, we created a workshop where skills were developed and the exchange was facilitated, so as to not leave this integral objective to spontaneous development. Viewers will also find a drastic change in the nature of the exhibits from the previous edition. All artworks showcased in 2014 used visual outputs aided by a projection or a digital screen. To minimize dependency on digital displays, Yantra’s artists and engineers have produced works that are ‘interactive’ contrary to our modern (mis)understanding of the term. Each work presented in this section, was developed and refined over weeks of hard work. They were created by artists and engineers part of the “Creative Computing” course hosted by Yantra between September and October, 2015. Works deal with the theme of “adaptation” by evoking human institutions, natural processes and even socio-political systems. “Where would the Impressionists have been without the invention of portable paint tubes that enabled them to paint outdoors?” asked writer Randy Rieland for the Smithsonian in 2014. In his article Rieland went on to propose, through several examples, how technology has empowered artists to express themselves in new ways while accommodating more interaction. The fusion of art and technology is still in its nascent phase. As the intertwining of technology and the arts continues, Yantra was fascinated by a different aspect of the relationship. Nepali visual artists often use technology as a subject in their critique of modern society. But it appears organically, coupled with the intended commentary of the author. It is easy to speculate reasons for this development but Yantra hopes to simply propose this as an enquiry worth exploring personally by the viewer. “Technology in Art,” is thus being introduced with Yantra 4.0 as a permanent section of the annual showcase. This section will present a curated collection of artworks that take up technology and science as subject-of-enquiry through the arts. For Yantra 4.0, Birgunj-based photographer Manish Paudel’s Waste is Beautiful (select photographs) and Kathmandu-based visual artist Kiran Maharjan’s Dimension have been selected. Yantra will continue developing this section in the future with new artists each year. Waste is Beautiful by photographer Manish Paudel was created during a workshop/residency at Climate + Change, an exhibition that ran between November, 2013 and April, 2014 right here at the Nepal Art Council. Paudel along with several other photographers created several bodies of work on issues of the environment for the residency. Selected from over 50 individual portraits of waste captured by the photographer, these 18 images present the inorganic end of the collection. These engrossing images present the beautiful side of waste. “To create a beautiful world we should first see beauty in it, even if its in the waste!” wrote Paudel in his statement for the work. Particularly for Nepal, the introduction of many modern household aides such plastic products have been detrimental to its natural heritage. And while the aides have helped us adapt to a state of ‘modern’ living, Paudel intends to tell the viewer – it is our unwillingness to accept waste (even when we are able to accept our consumerist ways) that leaves it unattended and liable to pollute. Dimension by Kiran Maharjan is loosely based on the novel The Difference Engine (Gibson & Sterling, 1990). Maharjan premises the story in alternate history: it is 1855 AD and the Sugauli Treaty never transpired – war with the British rages on. Shah kings have smuggled in British steampunk machinery, armoury and adapted it with traditional Nepali artistry and crafts to create a new age of machines: part temples, part automaton. Showcased here are 10 individual panels from Maharjan’s initial attempt at the graphic novel, which were created during his study at the Kathmandu University Centre for Art and Design. The panels introduce the story’s elusive protagonist, a Gurkha warrior transported to the alternate world from present-day reality. The warrior is on the run – hunted by the state desperate for information on the time machine that could change the course of the war. Science fiction is a staple of modern literary movements. It has allowed creative minds to wander beyond the limits of reality, to spin fantastical worlds, universes and dimensions. But the power of science fiction is grounded in its examination of the human condition. In this way, Maharjan’s Dimension is no different. The grim visioning of a war-ravaged Nepal becomes the seed which grows with the viewer’s imagination to take this (incomplete) story to many subjective tangents. The simplest of things can impact a vast number of people and their course of life. Behind such ubiquitous things exists a complex history of their production, distribution and use, with a large number of people embedded in the networks and institutions shaping such history. To appreciate the significance of such things, Yantra 4.0 awarded its first Yantra Research Grant in September 2015 to study the lives and after-lives of the ‘things-in-use’ that have, or have had, demonstrable impact on Nepali history and society. After an open call Mr. Arjun Panthi was selected to conduct the research and Dr. Yogesh Raj (Martin Chautari) was appointed as a mentor. The goal of the study is to produce an academic paper on a select few objects by February, 2016. Three objects selected by the researcher were: watches, shoes and umbrellas. While research continues, Yantra presents here several site-specific installations and photographs inspired by the objects (work by artist Prakash Ranjit is installed outside, within NAC premises). Viewers will also find quotes from several individuals reminiscing olden days when these objects were rare and luxurious. They evoke a Nepal before the introduction of these objects of significance. Homework: The game is a multiplayer arcade created by two young programmers part of Karkhana’s weekly courses. Inspired by Yantra’s vision and its newly introduced Research Section, the children have created a simple game where the mode of control has been swapped from a traditional joystick or keyboard to an actual object-of-use, corresponding to the game. In China, floating river lanterns is an old tradition. It drives away bad luck. In Japan, the gods are sent off by the same. Today, many islands in the Pacific remember the departed lost in recent wars, adapting this symbolic gesture (Toro Negashi) to context. There is turmoil around the world. Here at home, months have passed and there is little optimism in the current crisis. In Nepal rivers are regarded and worshipped as gods. We float oil lamps on leaf as offering to deities. Peace Pond builds on this tradition for a participatory creation of a modern symbol for peace, as gesture for hope of a speedy resolution to the ongoing political deadlock. Viewers can light and put a lotus flower on the lily pads, this will trigger it to float towards the center forming the symbol. Life on Earth has adapted over millions of years. With time, all species of flora and fauna have developed unique traits to survive. The plant species Mimosa Pudica likewise has developed a swift response to tactile stimuli where its leaves undergo a change in orientation. This curious movement is costly (in terms of energy) to the plant and interferes with the process of photosynthesis. Many explanations have been proposed to explain its behavior and most scientists agree that the plant’s ability to shrink is a defense against herbivores or to dislodge harmful insects. Inspired by the intrigue of the plant’s behavior, Mimosa is an attempt to reproduce the same mode of interaction. Viewers within the ‘interaction’ zone can interact with the exhibit with just their presence. Since 1990, Nepal has seen countless coalition governments fight over the nation’s direction. The change in political office is so incessant that most Nepalis will be unable to name all the Prime Ministers who have assumed office in the past 25 years. Our political system is broken. Party ideologies means there is never consensus and thus no action. Yet the institution grows, and stumbles into the far reaches of every social issue that affects the citizenry. The current crisis is just one example of the stagnation brought on by change of political representation. The Irritating Machine aims to simulate this frustration of our elected, into a time-based installation. The Sarangi, a bowed string instrument, is closely related to the occupational caste musicians of the Gaine or Gandharva community. For long, this community of traveling maestros served an important purpose – spreading information. The Gaine would travel to the remotest parts of the country singing, entertaining and awaring people with their melodic companion. With the advent of mass communication, the Gaine waned in relevancy and with it the Sarangi turned to a token of Nepali musical tradition. Thus to uplift the Sarangi into educational limelight, Yantra artists and engineers have created a sensor-infused version of the instrument. Viewers can use the exhibit to learn about the different notes and pitches that can be produced from a regular Sarangi. Also presented is a brief history and organology of the Sarangi. The dimensions of the sarangi depends on the its scale and range capabilities. The A-B-C-D range sarangi has a neck length of 3.25 inches and a bridge of 1/2 inches. Meanwhile, the E-F-G range sarangi has a neck length of 4.15 inches and a bridge of 2.15 inches. The string used can be of a variety of kinds including telephone wire, guitar strings, monkey gut and cycle gear wire. How the bow is made? – Small holes are made on both ends of the bamboo. – The skin to cover the hollow part of the instrument is soaked in water for about 7-8 hours, till it softens. It is then rubbed on a rough surface by hand and pasted onto the instrument with glue. – The bridge and string stand are mounted before adjusting the four strings of the sarangi. Sarangi is unfretted, bowed string instrument, which has a bridge resting on skin (membrane). It has a continuous wooden body which is covered by goat leather as a resonance cover. Sarangi is around one and half feet long and half a foot wide. The lower resonance chamber of Sarangi is hollowed out. The instrument does neither have a fingerboard nor frets. It has total four strings out of which three are main playing strings while the remaining string is a sympathetic string. Originally gut strings were used but nowadays guitar strings are also popular amongst the sarangi players. It is held in a vertical position and is played with bow. Pitch is determined by sliding the fingernail against the string or by placing fingers in different places of neck. The strings are played with the cuticle of the fingers of the left hand. A bow sets the strings swinging. 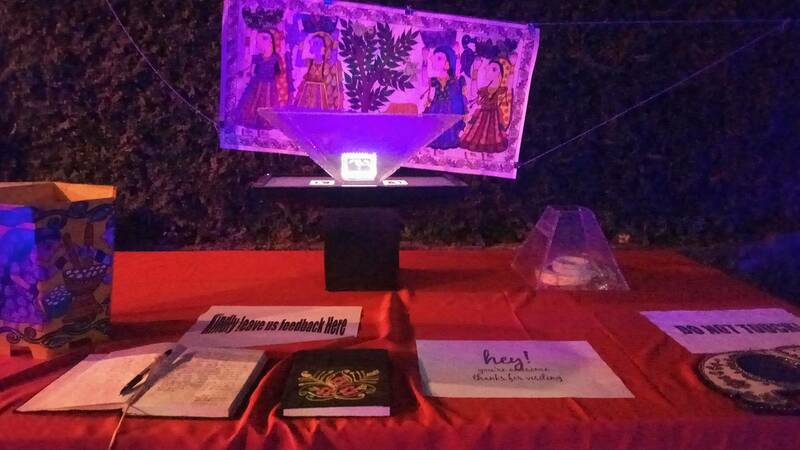 The fourth edition of the Art+Tech Exhibition showcased individual 4 artworks, loosely based around the theme of ‘Mithila and its aspects.’ Except for art showcase, all works were interactive and created in collaboration by technologists and artists over 40 days in October and November. Each exhibit was supplemented with an artist statement, which included the biographies of all collaborators involved. The week long exhibition attracted more than 1000 visitors, bringing together artists, art lovers, tech enthusiasts, engineers and, most importantly, laymen who would not have otherwise come to an art exhibition. The most significant constituent of the viewers were young Nepalis between the ages of 18-40. The exhibition was officially inaugurated on 9 December through a soft opening to host select invited guests who were invited through emails and social media sites. A formal closing event was held on the last day of the exhibition. The 4 artworks were exhibited at the Nepal Communitere in Pulchowk, Lalitpur. The Front Courtyard was used for the event for interactive artworks and Exhibition. The first piece for the exhibition was “Ganesha on the Bush.” Based on the design and beliefs of a traditional god Lord Ganesha, the installation presented the exact setup of ganesha temple on the wall carved out of bushes. Besides, the technical parts installed on the underneath, triggered two separate audios: one the continuous ringing of the holy bell and another blessings like audio from lord ganesha. 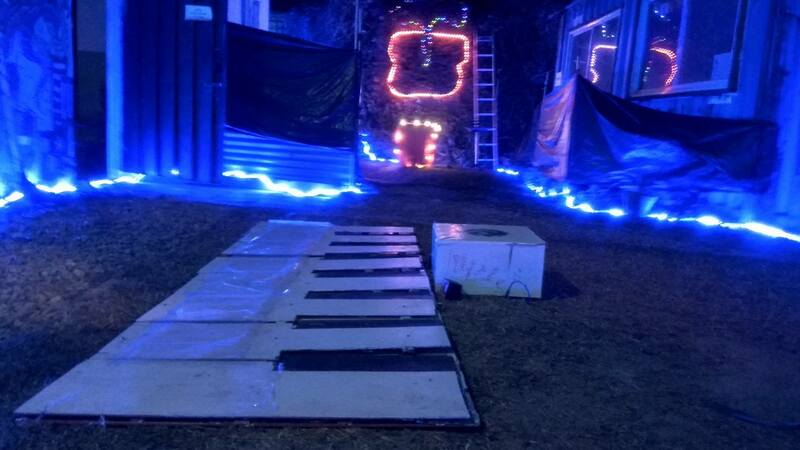 “Walking Piano” was installed on a floor on a rectangular wood base.. The installation focused on producing the real tones and melodies of the standard pianos and keyboards. This Experimental Tech +Art Collab installation was one of the most display during the exhibition as it generated lots of interest out of visitor. Different paper art piece of real aeroplane models were shown from Jet planes to fighter during the event. The another non-interactive piece at the exhibition was the display of a mithila culture’s painting and thangkas created using traditional and natural coloring techniques of mithila by janakpur art and craft center. Physical displays were supported by extensive texts on the process of Lost coloring used to fabricate the artworks. Other topics covered in the text were the challenges facing on creating the mithila artworks in Nepal with an overall aim to highlight the role traditional knowledge could play in modern mithila art practices. “Talking Tree” was a interactive tree installation supported by a technical parts that required the users to stand in front of the setup to trigger specific audio content. All content related to Nepali culture and importance of trees in hindu civilization. “3D Hologram” was a video installation projected over a acrylic topographic structure. As the “Hologram” project focus on presenting mithila traditional pattern, the projection were made up of short clips featuring the self made running patterns. Viewers could project their own 4 face drawings onto the project by physically placing over the storage hub in front of the project. On the other hand, one of the biggest challenges of the executing the show was the logistical requirements along with timing of the event. So, our theme was focused promoting Mithila arts, evening time was feasible for the visitors mostly job holders but for normal visitors it was hard to visit after 5 which limited the possible footfalls in the event. The digital aides was one of the major challenge. For the next art-tech exhibition, the dependency on digital aides (such as projectors, laptops, smartphones) should be curbed or in-kind sponsors of such infrastructure/equipment should be sourced. An alternative would be to create works like “Aeroplane & hologram showing Mithila Arts” where the requirements of interaction is limited. Alongside digital pieces, manually interactive pieces should also be encouraged.